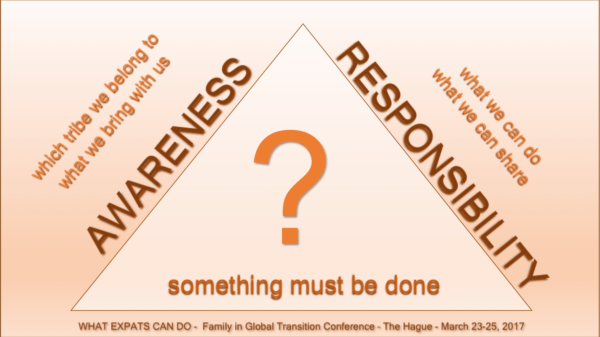 This is the presentation Cristina gave at the Families in Global Transition conference in The Hague in March 2017. I will start by sharing my feelings, so that we can practice empathy straight away: I need your empathy to help me, since this is the first time I speak in a conference and I have to do it in English (apologies to have to make you suffer for more or less10 minutes). Without repeating information that is already available on the website, I would like to introduce you to what is behind the project What Expats Can Do. Everything started one year ago, while I was sitting on the other side of this table and TheManThatIWillNeverThankEnough, Christopher O’Shaughnessy, was talking about the critical mission of the expat community. I lived abroad for 16 years, in 8 different countries, faced some serious cultural shocks. 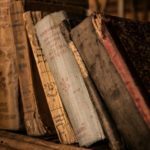 I quit my job and threw away my master degree and my career in order to pursue this kind of life, (I would say without being totally aware of that at that time). I am the stereotype of the expat spouse who sacrificed her social identity on the altar of mobile life. For several years I had been thinking of how I could recycle myself and how my experience could add a valuable contribution to society, apart from being a spouse and a mother. Everything I was considering to pursue, implied starting from scratch, and my experience not being evaluated enough. And that hurts, it really hurts, doesn’t it? Then there was that man, TheManThatIWillNeverThankEnough, saying something that was touching me deep inside. It was a simple concept: as expats we have gained skills that the world desperately needs, and one of them is particularly important: the ability to feel and create empathy and bring hope to other people. All through my life abroad, I was aware I was acquiring special skills, but I had never thought those skills could be useful for society. That was a new concept, a new way to see my life experience. Expats are generally not considered as a RESOURCE in society. Companies consider them a resource, but society doesn’t. 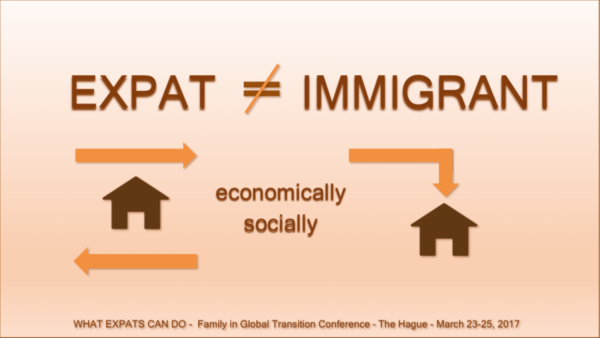 Immigrants are considered a social entity and it is understandable: their goal is to settle down, they have a significant financial impact on society (positive as an economical resource, negative for the cost of integration), they tend to integrate their families in the host country. There are governments’ programs to deal with their integration so that they can give their contribution to society. Expats are generally not considered as a social entity or, if they are, it is a kind of temporary consideration, strictly related to the nature of their assignment (military members, diplomats, executives, etc.). Outside of this role, they practically don’t have a social identity, their families are considered only as “accessories”. It is understandable: expats don’t bring social issues or problems with them, their financial impact on society is limited or controlled. Their integration in society is not an issue: they will not stay for long. In some countries expats communities are also “physically” confined inside specific areas to keep them separated by locals. And this is a waste. It is a huge waste of potential, because mobility is globally growing even if in different ways; the global expat community is growing. 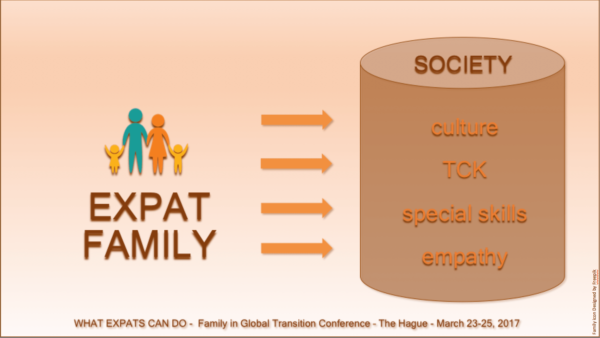 An expat family IS a precious resource for the local society. We are raising TCKs that are mostly educated in international schools, with a high awareness of the value of diversity, the ability to understand the perspective of others (as Anne Copeland brilliantly illustrated this morning) and the capacity of perceiving very naturally how the world is ruled and works. We gain special SKILLS and we learn how to practice EMPATHY. A clever ceramics instructor divided his pottery class into two groups during his first session. One half of the students, he announced, would be graded on quality as represented by a single ceramic piece due at the end of the class, a culmination of all they had learned. The other half of the class he would grade based on quantity. For example, fifty pounds of finished work would earn them an A. Throughout the course, the “quality” students funneled their energy into meticulously crafting the perfect ceramic piece, while the “quantity” students threw pots nonstop in every session. And althought it was counterintuitive to his students, the best pieces all came from students whose goal was quantity, the ones who spent the most time actually practising their craft”. Like in arts, it is the repetition of the creative process that develops human skills. finding ways to communicate and deal with different cultures and different kinds of people, with different values systems. We are definitively EXPERTS in this field !!! Consider all of this, not only from an individual point of view, but as a community of people (our tribe!!!). Maybe we are not considered socially, but we know how to deal with diversity and find workable solutions. We know how to deal with diversity and find workable solutions. Can you feel the importance of this? Do you realize the responsibility we have towards future generations, towards our children? The world desperately needs our skills in its societies. Are we really AWARE of our potential? Claudia and I have been talking about this with friends and people since last March. People usually say “Yes, it is true, I never thought about that”, because this is mostly an aspect they never rationally considered before. Then, assumed that we are becoming aware of this, the second step is a conscious assessment that if we have such a potential and richness in our cultural and social luggage, we have a responsibility to share it, especially in a world that needs to hear words of hope now more than ever. 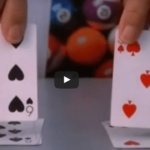 What can we really and practically DO? We need to find WAYS to value our contribution and get into ACTION, we need to create spaces where to share and transform our community into a social resource. And at this point … What Expats Can Do was born and answering those 2 questions is the main goal we have at the moment.